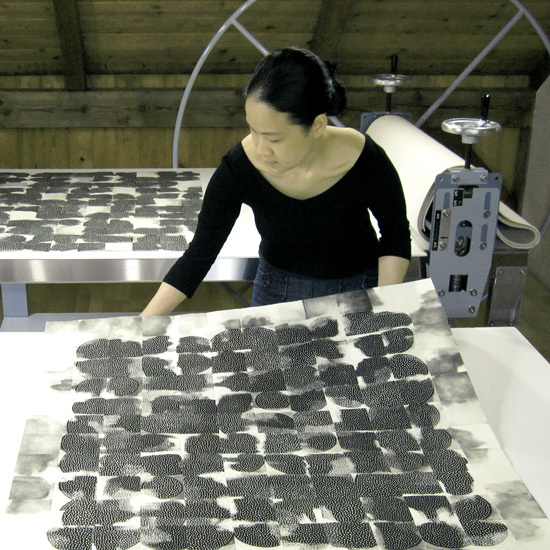 Seattle artist Eunice Kim is internationally recognized for exquisite minimalist aesthetic and singular commitment to sustainable printmaking. Born in Seoul, Korea and raised by her grandmother, Kim immigrated to the US at age ten. She earned a BA from California State University Long Beach, followed by fellowship at Kala Art Institute in Berkeley and graduate course work at San Francisco State University. Best known for her dot-based imagery, artist's newest work sources reclaimed wood as material and inspiration. Kim has been widely exhibited throughout United States and abroad, including Austria, Belgium, Bulgaria, China, Egypt, England, France, Korea, Poland, and Spain. Her works are held in public, corporate, and private collections worldwide, and represented by galleries in Los Angeles, Portland, and Seattle. She is a recipient of numerous accolades, including multiple 4Culture Grants, Alaska Percent for Art Commission, Arts Council for Long Beach Individual Artist Grant, Flemish Ministry of Culture Residency Award, Kala Art Institute Fellowship Award, The Puffin Foundation Grant, and Puffin Foundation West Grant.